Former National Security Adviser (NSA), Col. Sambo Dasuki (rtd), is fully set to storm the Supreme Court to press for his freedom denied him by the federal government after three different High Courts in Abuja had admitted him to bail in the criminal charges filed against him by the government. The ex NSA had on Wednesday at the Court of Appeal in Abuja lost his bid to enforce his freedom after he had secured bails on all the charges against him. 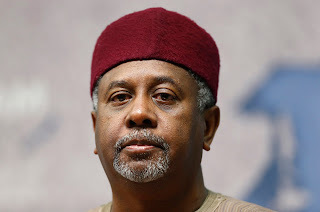 Dasuki’s lawyer Mr. Ahmed Raji (SAN) confirmed that appeal papers have been put together to be filed at the apex court to challenge the judgment of the Court of Appeal and the high courts that gave judgment to government on the re-arrest after bail. The SAN said there are sufficient grounds for his client to approach the Supreme Court to seek the enforcement of his freedom from detention ordered by the federal government after he had been granted bail by three judges who are prosecuting him on the charges. Dasuki said he was not afraid of trial in the charges against him as a former NSA but added that the proper thing must be done by government by respecting the bail granted him lawfully but courts. He claimed that since government had approached the court in his matter, the same government must be fully ready to abide by court decisions in the interest of justice and the rule of law. The ex-NSA had been admitted to bail by three different high courts in Abuja but he was re-arrested on December 29, 2015 by operatives of the Department of the State Services (DSS) on the alleged order of the federal government and had since been held incommunicado. But the government in its defence in a motion on notice filed in court, claimed that Dasuki being a Crown Prince of Sokoto Caliphate had large sympathisers across the length and breadth of the country who may jeopardise his trial if allowed on bail. Dasuki had asked the high courts and the Court of Appeal to stop the federal government from further prosecuting in the criminal charges until the bail granted him is obeyed and also pleaded that the courts should no longer grant indulgence to the federal government having been in contempt of the courts by the refusal to allow him freedom after the bail. In an unanimous judgment of the full panel of the court delivered by Justice Abdul Aboki, the Appeal Court upheld the submission of the Economic and Financial Crimes Commission (EFCC), which put Dasuki on trial, that it was not in contempt of any court order because the re-arrest of the appellant (Dasuki) in December last year was not at its (EFCC) instance. Justice Aboki said from the submissions of the appellant counsel, Mr. Joseph Daudu (SAN) and the EFCC counsel, Mr. Rotimi Jacobs (SAN), the bail condition granted Dasuki was perfected on December 29 last year and that a warrant released to that effect was served on the Comptroller of Prisons in Kuje, upon which he was released. On his re-arrest by the operatives of the DSS, the Appeal Court agreed with the Abuja High Court that the re-arrest cannot be turned to a disobedience to its order on bail because the court bail was not targeted at the DSS when it was granted. The appellate court also said the EFCC which put Dasuki on trial on criminal charges at the FCT High Court cannot be held responsible for the action of DSS on the ground that the two agencies are different entities established by different Acts and vested with different powers. Besides, the appeal court said there was no existing order against the re-arrest of Dasuki and that since there is no existing order, there cannot be a disobedience to a non-existing court order. The court held that the appellant ought to have established the terms of court order on the bail clearly to indicate in clear terms, the agency that can be held for contempt if the order is violated. In the appeal, the court said Form 48, which deals with contempt of court, was not served on either EFCC or DSS and as such, the two agencies cannot be held liable for the offense of contempt. Justice Aboki therefore held that there was no violation of any court order either by DSS or EFCC in respect of the bail granted Dasuki on December 18, 2015 and his subsequent re-arrest on December 29, 2015 by DSS operatives, shortly after he perfected his bail condition and secured freedom. However, the Appeal Court warned that court order must be obeyed and the issue of bail was a right to any person charged to court adding that any act of disobedience to court order by government is injurious to smooth running of the society and it is an invitation to anarchy. Dasuki had approached the Court of Appeal praying it to set aside the ruling of an Abuja High Court which exonerated EFCC from his re-arrest shortly after he perfected his bail conditions. He asked the appellate court to void the ruling of the High Court and set it aside on the ground that DSS and EFCC are both agents of the federal government which is the complainant in the charges against him at the high court.